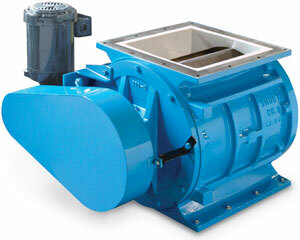 Rotary Airlocks and Feeders are available in various materials of construction and are uniquely designed for a wide variety of applications. Airlocks are precision machined for close tolerances and are designed for gravity feeding applications, to hold pressure or vacuum in a system, and to meter material into or out of a pressure or vacuum conveying line. Rotary Feeders are used to meter material into pressure or vacuum conveying lines in applications where stack-up height is limited or where conveying air passing through the vanes assists in material discharge.